Aki is expected to be fit for Ireland's first Test in Australia. 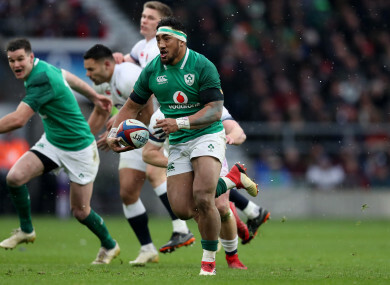 BUNDEE AKI HAS been forced to withdraw from the Barbarians squad for Sunday’s clash with England, but the injury isn’t thought to be serious enough to make him a doubt for Ireland’s first Test against Australia. The Connacht centre was due to captain the Baa-Baas at Twickenham but has pulled out as a precaution after rolling his ankle during a training session with his province in Galway. Joe Schmidt names his Ireland squad for Australia tomorrow and Aki is expected to be fit for the tour opener in Brisbane on 9 June, despite his omission from Pat Lam’s finalised 23-man panel for Sunday. The Barbarians coach will also be without Charles Piutau, who suffered an Achilles tendon injury before Ulster’s Champions Cup play-off win over Ospreys at the weekend, while Sale Sharks have withdrawn out-half AJ MacGinty. It means Lam has added five extra players to his squad for the annual Quilter Cup fixture against Eddie Jones’ side, with Connacht prop Denis Buckley among those called up as he joins team-mate Niyi Adeolokun in the selection. Scotland out-half Finn Russell, World Cup-winning centre Malakai Fekitoa and Fiji’s Josh Matavesi come into a star-studded back line, with flanker Nili Latu of Newcastle Falcons the final addition. “It’s unfortunate that Charles Piutau strained an achilles tendon warming up for Ulster on the weekend, Bundee Aki rolled an ankle in training in Galway and AJ MacGinty has been pulled out by his club,” Lam said. “But it’s great that we’re able to call in some more quality players following the weekend’s semi-finals. Finn Russell comes in from Glasgow, Malakai Fekitoa from Toulon and Josh Matavesi from Newcastle, and they’ll all add to the Barbarians way. Email “Bundee Aki pulls out of Baa-Baas squad as a precaution after ankle injury ”. Feedback on “Bundee Aki pulls out of Baa-Baas squad as a precaution after ankle injury ”.